Can we send back the garment we've bought on line ? Attention we do not have to take back made-to-measure clothing, as these garments have been made specifically according to the customer's requirements and can not be sold to another client. What payments can be used on the one line shop ? These are the payments we offer at this moment . How are the prices set up ? Our price setting is based on the measurements of the garments. for basic jeans we use this way af calculating. for standard sizes (STD) these prices are depending on the waist and inner leg length , following the rules we've set up. We add a calculated surplus when waist and inner leg are passing a certain measurement. When you choose an STD jeans and you enter the waist and inner leg you will see the calculated price. for made to measure (MTM) these prices are depending on the hips and side length , following the rules we've set up. We add a calculated surplus when hips and side length are passing a certain measurement.When you choose an MTM jeans and you enter the measurements you want, the system will calculate the price before adding to your shopping cart. This calculated surplus is also depending on the style and fabric you choose. where can we buy Godfrieds jeans ? Godfrieds jeans are on sold by our online store. We developed our online store ourselves, its a Drupal CMS (7) with the commerce module as a central part, it is not a state of the art website, but all the functionalities that we need are included and work as it should. Drupal is not the only open source application that we use in our production chain, the patterns are calculated in a Libre Office spreadsheet. This spreadsheet generates an XML file that we then import into Inkscape, which ultimately creates an SVG file that we export to a plotter, the only not open source thing we use is our windows operating system. How did we come to this point of vision and what is driving us ? In 2007 I started thinking to try to skip production steps in the garment Industry, and in this way to have ecological and sustainable jeans. Already in 1987 I had the idea that some textile steps are not necessary, like Skewing and Sanforizing of the fabric. These things can be calculated in the patterns, if you know what you are doing and you have control over your production process, you can have a normal pair of jeans as result. So the following 10 years I developed a pattern calculation system that produces a pattern (xml- svg format).In 2012 I also started a website (JOTL : jeans of the loom) where a client could enter his measurements and the systems calculates a pattern following this data. This website has been set up in Drupal 7, This "of the Loom" had to indicated that we are able to make a pair of jeans directly after the weaving process , "of the loom" without any finishing treatments after the weaving. We are also having plans (in our head) to weave on a Jacquard loom the patterns in our denim so that we could personalize a design on our jeans like the client wishes, so if we are weaving a design for a client , we can also combine this by weaving the pattern on the jacquard loom :: Woven To Fit (these are only thoughts). In 2017 I changed the name to Godfrieds to avoid problems with other Of the Loom company's. As I'm the 6th generation of people that earn their living professionally on making garments, there must be something in my genes that helps me forward on this road. The first was Jean-Baptiste Vanden Daele (Eine 1792-Ouwegem 1879) Tailor in Huise. Also some frustrations are also pushing me. In 1983-87 I studied at the Koetsier school in Amsterdam, where we were trained to ameliorate way of productions ....,however I experienced a stand still of 30 years in the garment industry, all European companies have send their old machines to low cost countries where they could find people working at very low wages. Like this, all development or new technologies or other ways of production are not needed, or don't gain extra profits. Result is that most of the garments produced nowadays have been produced on standard sewing machines, automation in the garment industry has lost 30 years.On this link you can see the automation level in 1990 at Wallys jeans. I've been working (link) and traveling a lot in north Africa and in eastern European countries where al this is illustrated. All the classic machines my father had during the 70 - 80 ties are the same ones I've seen in all these countries till now. It was even not done to send complicated sewing automats to these countries because of you wouldn't win anything by doing this, on the contrary you would lose money by doing that. What the future will give ? How do you have to maintain or handle your Godfrieds jeans ? how to care for your jeans, in every garment of Godfrieds there will be a stamp telling you what to do . Wash your jeans as less as possible, this wil accentuate more the whiskers that that will appear on your jeans, the base color of your jeans will be kept darker bleu for a longer time if you wash the jeans less, als by using detergent for black or dark colors will give nicer results. If you also don't iron your jeans, the whiskers will always be on the same place and be more accentuated. The only detail that can be ironed is the side seam , these should always be open (self edges of the denim).Normally these side seams will be open, but after washing it is possible they close or turn to one side. As it is the first time you will wash the jeans it is important to wash separately, or together with other bleu jeans , because all dye particles that are not bounded to the cotton will come floating in the water and can color other garments in the machine. Are there Customized styles available in Godrieds jeans ? In the future, when we'll have our pattern system 100% working as it should, and we start to know our clients we want to introduce some styles on which the client can customize his pair of jeans , different stitches, designs of pockets , different legs...? It is also possible that we consider making asymmetric jeans, for people who have problems by having an asymmetric body. Are there different fabrics available for Godfrieds jeans ? 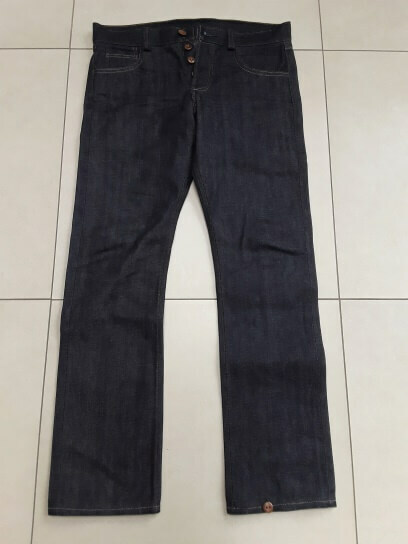 It is important to mention that Godfrieds only sells Raw denim, this means that we only sell unwashed or untreated denim, this means you get the pair of jeans in the fabric as we buy it at our suppliers (dark bleu ,hard and stiff), it is up to the client to make his pair of jeans a used one by wearing it intensively. The result will be that after months of wearing the jeans, it becomes part of you , and it will have a use image that is part of you and your habits. Normally you should rotate your jeans,always have 3 pairs in rotation: a new raw pair,a pair you've been breaking in for a year , and your favorites - those that have been on the front lines for the longest.Focus on wearing you newest pair most until they wear in. At the moment we have 3 selfedge denims,one Italian from Candiani and 2 Japanese one from Kurabo and one from Japan Bleu co.,ltd available. of these 3 denims , Candiani is the one that is doing the most in terms of sustainability and ecology.the denim we use at this moment consiste of 40 % BCI cotton. Are there different styles of Godrieds jeans ? at the moment we offer 1 Style . In the near future style 2960 a slim fit jeans worn in the waist and a 2570 slim fit jeans worn on the hips. are the godfrieds jeans produced small-scale ? In the first set-up and also for the future it is our intention to be and remain small-scale (Company link), this is the only way (we believe) to remain ecological and to avoid unnecessary transport and production steps. If we break out of our grind, then our philosophy is to copy the production unit that we have and plant it in a new "sales" market, so we can deliver that new market by their "own" production unit. At the moment we are struggling with the problem of what to do with customers who want to purchase jeans from another continent, are we going to deliver them or not? At the moment we stay in the Benelux. are godfrieds jeans ecological ? We've managed to make our jeans out of 100% natural (organic) materials. Theoretically our jeans are 100% compostable with 0% indigestible residual material. We use non-petrochemical raw materials (99%) you won't find any metals either, in normal jeans you can find aluminum, copper, brass, steel ....used for buttons,rivets and zipper. Pocketing fabric is a 100% cotton, and no mix of polyester so that afterwards (when the pants are discarded) our pocketing will not cause micro plastics. The stitching yarn is 100% linen (UK), for this, we use yarns that until recently were mostly used in the leather industry. 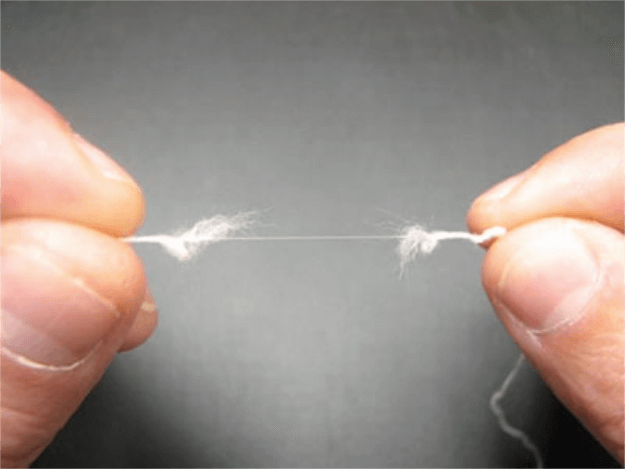 This yarn is stronger than the normal used polyester yarn, which can also cause micro plastics. For seams where we don't have extreme forces (overlock yarn), we use 100% cotton yarn. The buttons we use are Corozo buttons, also called vegetable ivory, and has long been used as a material for buttons, long before the arrival of plastic buttons. These buttons are made from the nuts of the Phytelephas. At this momnet we don't offer stretch fabrics. what is the level of sustainability of Godfrieds ? if we still have to expand we wil set up a new production unit centralized in the new sales market. Like this it will always be local people that produce the jeans. -planet: we strive to skip (in the future) certain production steps that are regarded as normal and necessary in the clothing industry. Like this we try to eliminate Sanfor and skewing of the denim, we process this in the patterns and if expertly followed up in the production we achieve the same result but without gigantic machines and factory halls. We are also considering setting up a repair service to repair our jeans, how we should set up this practically and ecologically responsible is still the question, we can't drive 100 km to pick up a garment to repair. We are small scaled, and only sell in the Benelux, this means that we are not traveling around the world to produce a pair of jeans. We buy our denim (mainly) in Italy, the only country where we can buy selfedge denim, we have no influence on them where they buy their cotton, and how this cotton has been cultivated, but as they participate in the BCI (better cotton initiative) they are doing effort on this. -profit: the profit that will be made by selling our jeans will be used to try to ame for our goals that we've set up in our vision, we will not pay a dividend to our shareholders, because we do not have shareholders. Where are the Godfrieds jeans produced ? Our trousers are produced in Belgium and do not travel around the world to reach the final consumer, like this they are not made by children or otherwise exploited people. Producing in Belgium means that every step of the productions is done in Belgium, styling,pattern making, cutting, sewing, finishing and packing. what is the Quality standard of Godfrieds ? For the assembly of our garments, we use the highest quality raw materials and methods that fit our vision. For the main fabric, denim, we use selfedge denim, this type of denim is woven according to the age-old way with shuttle-looms which, as a result, gives a nicely bound selvedge to the fabric that we use in the side seam of our trousers. The trousers are hand stitched in our atelier in Belgium, on machines that have been used for decades, and still, are used for manufacturing jeans. We are the sixth generation in a row that makes professional clothing in Belgium and so have the craftsmanship in the genes and use this craftsmanship in our pants.On the picture you can see the 3th generation Henri and 4th generation Frans. We firmly believe in chainstitch machines (above the lockstitch machines) that gives an elastic stitch and therefore will break less quickly, all stitches, except the bar tacks and design stitch on the backpockets are chainstitch. Our buttons are Corozo buttons, before the plastic buttons, this was a common button worldwide. These buttons are manually sewn in order to get a nice Neck Wrapping. As for sewing thread, we mainly use linen yarn, which used to be very common, which is a beautiful and very strong yarn that becomes even stronger when wet. 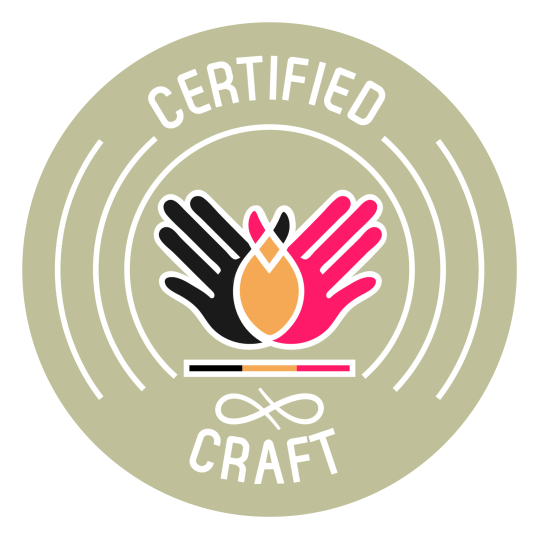 Since September 2018 we are officially recognized as craftsman. What is made to measure ? bespoke jeans ? if this is all too complex or too many work then we have another solution that is the version of the trouser following standard measurement charts (STD), to produce jeans in this way , we only need the waist and inseam and we will produce jeans for you like al the other brands produce jeans in the Mass productions, note that our production is always piece production....you order 1 piece , we make 1 piece.